Terminal cup washers are used to provide a good electrical connection by limiting the expansion or a cable end when clamped. Also used with cable lugs. 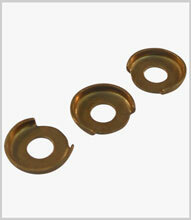 Generally in brass or stainless steel in metric or imperial sizes.